Have an excellent Easter with your family, friends, and the local community with a number of brunch specials and events. They are so good you'd think the Easter Bunny brought them just for you. Bookman's Egg Hunt Saturday March 26. 10 - 11AM Mark your calendars for the arrival of the Bookmans Ina Bunny! Let your little spring chicks loose on the hunt for eggs they'll have hidden all over our store. Each child will be allowed to collect ten eggs as they wonder the aisles looking for treasure! Only Bookmans Ina location. More info here. Tucson Botanical Garden Eggstravaganza 10AM - Noon Celebrate at the Tucson Botanical Gardens with Spring-themed crafts and games for children! Egg hunts will be offered every 30 minutes and hunt areas will be divided by age group. Colorful bags will be provided for egg collecting. More information is available here. Celebrate Easter at the Children's Museum Tucson Saturday March 26, 2016. There will be an Easter Egg Hunt at the Children't Museum Tucson the day before Easter Sunday from 10am to 2pm. Full information here. These fantastic local restaurants let Local First Arizona know they will be open for service on Easter. Please call for hours, menu specifics, and reservations. Reservations are strongly recommended. Please see our Local Business Directory for even more restaurants throughout Arizona! Duck & Decanter Easter Baskets All Duck and Decanter locations will be closed on Easter Sunday but drop by the Camelback location of Duck and Decanter and pickup your pre-made Easter basket before Easter weekend! These pre-made baskets start at just $25. To place an order for a personalized basket stop by the Camelback location or call 602-274-5429. Spring Basket Bonanza Saturday March 26, 2016. You are invited to Spring Basket Bonanza to decorate your own basket to celebrate the season. The museum will provide a basket and an assortment of fun kid-friendly, spring-themed decorations. This event is $6 for members of the museum and $8 for non-members. Space is limited, tickets and info here. Tammie Coe Cakes Has Precious Easter Treats Tammie Coe Cakes has morphed the famous sugar cookies for the springtime season, including the little bunnies and carrots pictured. These would be a sweet treat for any Easter basket. All orders require 48-hour advance notice. Clothes Minded Easter Saturday Event March 26, 10am - 5pm Join Clothes Minded on Saturday! There will be a local grade schooler who designs tshirts selling her adorable designs perfect for Easter baskets. Tammy Auther Vintage Designs jewelry designer will be selling her upcycled vintage pieces of jewelry and there will be a free gift with any purchase of $40 or more. Clothes Minded does complimentary gift wrapping as well. Sedona's Celebration of Spring Inflatable toys for kids, petting zoo, pony rides, face painting, carnival rides and much more are included with the $5 admission fee for the youth attendees at Posse Grounds Park. The official egg hunt will begin at 10:00 a.m. for children 8 years of age and younger. There are over 10,000 eggs waiting to be found! Children need to bring their own baskets. Full info online here. Payson Eggstravaganza Sat Mar 26th 9.30am - 11.30am The Annual Eggstravaganza for children ages 12 & under will begin atRumsey 2 Softball Field (near Taylor Pool). Children can collect eggs filled with candy and coupons for special prizes. Complete information is online here. 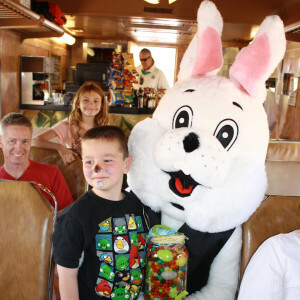 Easter Bunny Express on the Verde Canyon Railroad This once-a-year opportunity to hob-knob with the wascally wabbit begins with face painting on the patio so everyone can star in a look-a-like photo. The honorable hare will dole out handfuls of treats and armloads of hugs before bidding farewell to everyone on the train as it departs at 1 p.m.. More information online here. 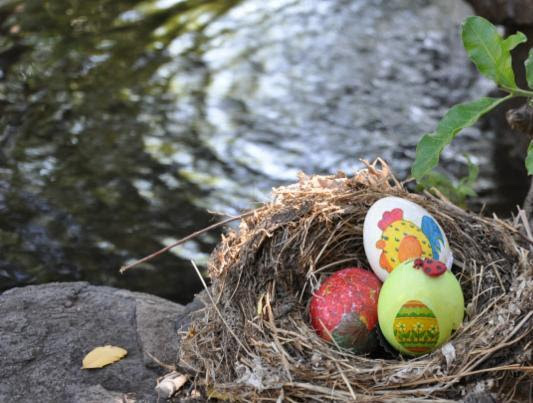 Get out of Town with the Friends of the Creek Stay with any of the "Friends of the Creek" (Christopher Creek Lodge; Grey Heckle Lodge; and Cabins at Creekside) on Easter Weekend and join us March 26th for an Easter Egg Hunt and Celebration! There will be snacks, games, activities and prizes. In addition, your kids can enjoy egg decorating, bunny coloring and pictures with the Easter Bunny! Call us at 928.478.4300 today for more details and to reserve your cabin for an unforgettable Easter Holiday while availability lasts!